CyArk team memebers Ben Kacyra and Elizabeth Lee recently traveled to Mesa Verde National Park as part of an on location shoot for the new PBS show, Wired Science. 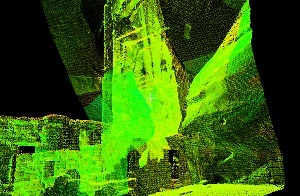 In addition to giving interviews about CyArk’s mission and documentation methods, the team preformed a High Definition Documentation of the alcove site Square Tower House. The site proved to be the perfect site for the shoot for with its dramtic setting and its real need for documentation and structural analysis. The cameras were rolling as the HDD equipment had to be lowered over 100 feet down to the site and team members had to decend using hand ropes, ladders and steps carved into the rock face. Last winter the site suffered damage when part of the rock face sheared off and crushed part of the site. Mesa Verde site managers were anxious to document the site and see what other structural damage may have been caused by the rock fall. The show is now in post production and the data is being processed in the CyArk offices. Check back for updates on when the episode will air and be sure to look for the new Square Tower House project in the CyArk Archive.